This is a piece by Melia Robinson. Melia is a Syracuse University junior, dual majoring in magazine journalism and information management and technology. She is the design director of The Student Voice, a biweekly student-run news magazine, in which this piece originally ran. Lynde Folsom was a curious child. When she was four, she asked her mother that if God was all-powerful, why couldn’t he bring her pet frog back to life. A year later, she asked if she prayed enough to God, could she get wings. In the wake of Sept. 11, nine-year-old Folsom asked why people were killing each other over religion if religion is supposed to be peaceful. It made no sense, she said. Frankly, Folsom didn’t believe in God. Her passion for science and years of asking questions led her further away from her family’s Catholic background. As a college freshman, Folsom found the Secular Student Alliance at Syracuse University and SUNY-ESF, and she never looked back. Folsom, a sophomore neuroscience and philosophy major, followed a religious path not uncommon among college students, although she is one of a handful who openly identifies as atheist. At Syracuse University, incoming students are asked to complete a religious preference survey on MySlice where they indicate their affiliation. The results are somewhat misleading, as only 49 percent of the study body participates, according to the Dean’s Office of Hendricks Chapel. However, the sample indicates that the largest religious communities on campus — Episcopal/Anglican, Jewish, Presbyterian, United Church of Christ, and United Methodist — have all dipped between fall 2001 and fall 2011. Affiliation with Roman Catholicism, SU’s largest religious population, fell 9 percent. The numbers at SU reflect a national trend in religious disaffiliation in people 18 to 29 years old, a February 2010 study by the Pew Research Center found. The report, titled “Religion Among the Millennials,” concluded that one in four adults under the age of 30 describe their religion as “atheist,” “agnostic,” or “nothing in particular,” compared to 14 percent of participants older than 30 who consider themselves “unaffiliated.” Members of the Millenial Generation are also more likely than older generations to switch religions or become totally unaffiliated, the study reported. The relationship between the SU religious preference survey and the Pew study suggests that with each passing generation, more Americans are disaffiliating from their religious groups, and doing so earlier in life. Tiffany Steinwert, the dean of Hendricks Chapel, understands why college is such a common backdrop for religious transformation. Many people at this age begin to question what they believe and why they believe it, Steinwert says. They’re often only familiar with the religious tradition of their parents, and suddenly, in the university environment, they can experiment with a diverse faith pool without pressure or judgment from their families. 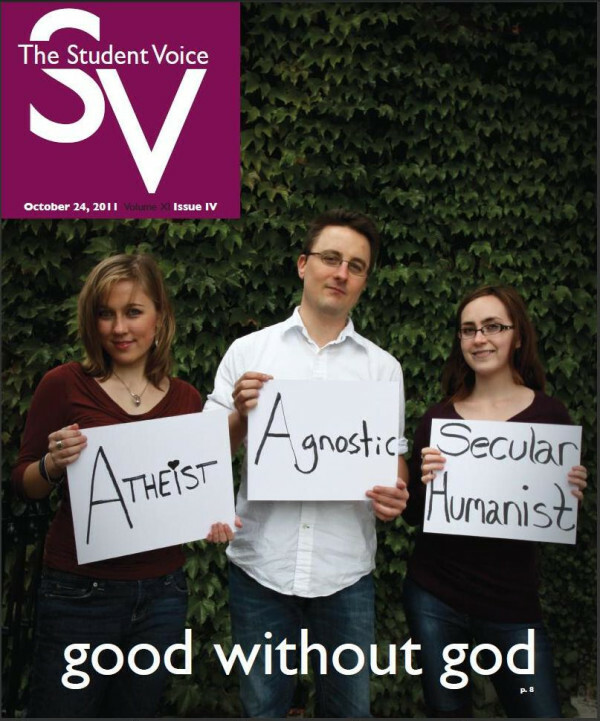 Atheism is the view that no gods exist, because the assertion of a god is an un-testable hypothesis, according to the national office of the Secular Student Alliance. Agnosticism is a diluted version of atheism, and holds that the existence of a god cannot be logically proved or disproved. “Non-theist” acts as an umbrella term, encompassing all the belief systems that deny the existence of a god or gods. The negative connotation of “atheist” typically washes over these varying degrees of non-theism, and the fuzzy landscape of secularism can be unsettling for recent converts, according to Tarayn Ryan, president of the Secular Student Alliance at SU and SUNY-ESF. Members of SSA aim to mentor students who disaffiliate in college. The labels of non-theism are shrouded in ambiguity, but the discrepancy between them represents a relatively insignificant obstacle in the way of the secular community. Students who come out as atheist or agnostic are sometimes confronted with hurtful stereotypes or hostility from their family or friends. It’s a pattern of harassment that prevents unaffiliated students from choosing atheism. SSA founder James Johnson, a graduate student studying plant science and biotechnology at the SUNY-ESF, says over half of their fliers are vandalized or torn down, particularly on the SUNY-ESF campus. Various members recall being named a “Satan-worshipper,” being told their “existence as an atheist” was offensive, and being pounded with Bible verses. Two weeks ago, SSA members chalked the Quad to promote the group’s recent name change from Atheist, Agnostic and Freethinkers Alliance. They wrote phrases like “good without god(s),” “got reason?” and “Don’t believe in God? You’re not Alone.” Overnight, someone crossed out their work and wrote insults over it. During the next SSA meeting, members discussed the vandalism and ways to calm down confrontational theists. SSA officer Matthew Davis, a graduate student studying electrical engineering, was upset but unsurprised by the incident. Dean Steinwert, who felt disturbed by the vandalism, said the Hendricks Chapel community is widely receptive to opening the conversation. But in light of the vandalism and widespread ignorance, disaffiliated students may turn away from the path of atheism. One student, who asked his name not be used, remains closeted in his conservative workplace for fear of discrimination. The officers of SSA hope to liberate non-theist students from that fear of rejection. Actively denying the existence of God, as atheism does, opens up a network of human connection, according to Folsom. It provided her with a group of like-minded people with whom she could belong. For students who want to explore a new faith tradition, abandon religion altogether, or don’t know what to believe, Folsom assures them that joining the secular community can be scary, but worth it. “We’ve gone to the dark side, and there’s cookies here,” she said. Will Religion Make Justice Scalia Resign? For me college was a period of realization. I went in thinking I was Methodist. I went out realizing that I had never believed, understood, or took any of it in. No real inquiry on my part, just the realization that I had gone through some of the motions but all of it went in one ear and out the other and that it all sounded ridiculous and inconsistent with life. For me, the real inquiry came thirty years later when I decided to read all I could to check that I was correct in my atheist views. I was, because it is the only realistic, rational view. Good article. However, I don’t agree that “agnosticism is a diluted version of atheism,” as stated by Robinson. Atheism and agnosticism answer two different questions. Atheism answers: Do you believe there is a god? Agnosticism answers: Is there a god? These two terms are not mutually exclusive. This seems to discount the many of us who simply lack the view that gods exist, and who don’t actively deny the existence of gods, but instead remain unconvinced by the active assertions that gods do exist. I get absolutely irritated when I hear that atheist signs get vandalized or torn down. If we did the same to a religious posting we’d probably get charged with a hate crime. There’s a church in my town that posts messages on its sign like, “Only a fool denies the existence of God”. Every time I drive by I fantasize about coming back in the middle of the night to change the message to something more atheist-friendly. But I never do, because I have the conviction of my (lack of) beliefs, and I don’t need to deface a fricking sign to validate myself. It seems to me the only fools are insecure religious bigots. It’s making it really hard for me to be a friendly atheist. How about a furious atheist instead? An interesting article. I am glad to hear that non-believers are finding ways to feel included and safe when voicing their thoughts on the God question. However, as a Sunday School teacher, I am rather dismayed when I read about the honest questions a young person has voiced about God and religion (such as Lynde did) and yet have probably witnessed no serious effort made on the part of adults to thoughtfully answer them. It is one thing to ultimately find one’s self rejecting, as inadequate, various explanations about God and religion. It is another thing altogether to have no chance to really explore the subject in an intelligent and thoughtful way so that a usefully informed decision can be arrived at. Usually the kind of responses received seem to have no depth at all to them, nor does the adult seem to be interested or even able to voice anything deeper than “just accept it” or “you’ll understand later” or “just have faith”. If adults have not explored this complex subject in any thoughtful way themselves and come to a reasoned basis for their own belief and faith, how do they expect a child to successfully navigate it without help? Regarding the question of “other” and “atheist”. For what it’s worth, in my view, if a person isn’t constrained by dogma, it doesn’t matter so much if he or she believes in dubious entities or phenomena; after all, the only truth out there is reality itself, and all we see is some projection of it onto our minds. Just like we really should have no say over whether one can have an abortion, use drugs, or dance around naked in the middle of the night, I think the “spiritual question” is really a matter of opinion. The supernatural is not our biggest problem as a society. Sure, it’s annoying to see gullible people buying homeopathy, feng-shui, and bunch of other BS, along with charlatans exploiting their gullibility, but it’s chicken scratch. A much bigger threat to freedom and progress is herd mentality with organized religion (and political ideologies, but that’s another story) that facilitates it. As long as people are disaffiliating themselves from this institute and starting to use their own brains, I say, hooray for independent thinking.